I hope everyone sees this movie! I believe it will be a great faith builder and an effective tool in dealing with skepticism. I loved the book! The movie, "Heaven Is For Real" opens in theaters on April 16th! 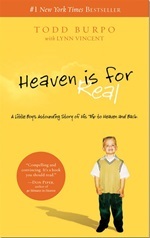 Having recently screened the new movie adaptation of the book, "Heaven Is For Real," I spoke with Colton Burpo's dad, Todd, about all that his son experienced, and what he thought of the movie that tells their story. Aimee Herd: As you've written the book and now the movie is finished and set to be released, do you feel it was accurate to what Colton and you and Sonja experienced? Todd Burpo: That was one of the big concerns and overwhelming questions as we started this project; [because of legalities] they had to create a town and create some characters... I asked, "How do you avoid the legal obstacles and still tell the same story?" I really struggled with that, but at the end of the day—three years later—they really accomplished that. They did create characters who were compilations of [real] people, but they had all the same conversations that Colton had—just different characters, but the same events. Of course our family was the same, and especially when it came to the family dynamic and interaction, even people who have read the book, and who have seen the movie (in a pre-screening) really love it, because it's so true to the book and what really happened. AH: That's good to know, because I loved the book, so I admit to feeling a little doubtful prior to the screening, but once I saw the movie, I was really impressed. Tell us about Connor Corum, who played the role of Colton; he was an amazing little actor, and I thought he did a phenomenal job, but you're Colton's dad, so what did you think of his portrayal of your son? TB: Well, you almost have to understand how God brought Connor to this movie. Conner has never acted before. It's miracle after miracle in the way that God selected Connor—God had to find a kid who was just like Colton. My wife and I were having lunch one day with Connor's parents (he was with them), and while we watched him and talked with him, we said, "This is Colton!" When Colton met Connor, it was like him meeting his "mini me." Essentially, Connor was not acting. In the scene where Connor holds the spider at the butterfly pavilion, he was really scared—he was not acting—we didn't know whether we would get him to hold the spider or not. (Laughs) But at the same time, that's why Connor does an incredible job [in the movie]. AH: When your son Colton first began to speak about Heaven, how long did it take before you were sure that his experiences were real, that he had truly experienced Heaven? The next conversation [that convinced me] was when he could speak of things that he saw in Heaven that I knew he had never [yet] read about in the Bible—and he was so Biblically accurate. Then things started to turn for me. But when he talked about meeting his sister in Heaven and talks about my Granddad and speaks about how I played with him as a little kid—and he's not missing any details and these details are right! There's no way a four-year-old can invent things like that. All those things just continued to penetrate... I think what I really struggled with was not so much my faith about Heaven, but I had no experience with near-death experiences; I had never met anyone who could talk about what Colton was able to talk about. I have been at the bedsides of many people who have passed, but not someone who has come back like my son, and who shared what he's shared. I think all of that is depicted accurately in the movie. AH: Did Colton's experience and what he shared with you mess with your own concept of Heaven? How did you reconcile that? AH: The movie depicted some turmoil that you experienced in your church, and as a pastor, because of what Colton shared. I hadn't really thought about that aspect before, was that accurate? TB: Well, in the sense of me taking a leave of absence and then coming back to preach, that was part of what they added to the movie because of time; you have less of it to tell the story in a movie than you do in a book. But, beyond that, all those different reactions we had from so many different people, both in and out of the church, were all honest. AH: Now, Randall Wallace—who directed "Braveheart" was the director of "Heaven is For Real"—how did that come about? TB: (Laughs) God had way more to do with that than I did. Joe Roth was the main producer of the film, and he knew that this was a movie that Randall Wallace was supposed to do. Joe called him and told him he had a movie for him and he was the guy to do it. And Randall made it his own. I tell people this is a "no mascara" film, and it is. Emotionally, there are moments where you may cry, because you identify with what it feels like to almost lose a son, and then I've seen audience members jump and shout because they're excited. Randall Wallace just brings it—brings all those elements to this film. AH: And prior to the movie—in the screening I saw—Randall spoke about his involvement in the film, and he seemed very genuine that he had been affected by Colton's story. TB: One of the perspectives he shared is that "faith is not just a decision of your intellect, but one of the heart and your whole being, and I wanted to make sure that was in this movie." I think he did that beautifully. AH: Todd, can you tell me what was the most recent revelation or experience that Colton has told you about during the time he was in Heaven? TB: Colton also told me around the same time: "You know Dad, satan used to have a throne in Heaven, but they tore it down a long time ago." The commentaries even say that. AH: What does Colton think of the book and the movie? TB: He says, "It told the truth, that's exactly what happened." My son's a 'black and white' kid. I don't care what the critics say, if I was going to keep the respect of my son, there was no way I was going to be able to exaggerate or make anything up. I was concerned, as a parent—was he going to be okay with the movie. And he is, he really likes it. AH: Are those experiences in Heaven still vivid for him today, and does he speak about it much apart from the book and the movie? TB: Well, some of them have faded. I think all of us, when we get older, can't remember quite everything [we experience as young children]. But fortunately, the people he met and spoke with in Heaven—those memories are still very clear to him—family members, and especially Jesus. I'm very grateful for that. We've prayed so many times, "Oh God, this is so important, please let Colton remember [his experience]." I believe God has answered those prayers. AH: I can't help but wonder... yes he had that experience, but what about Colton's own faith walk? Does he have a strong faith? TB: He does, but you have to understand his perspective growing up... which most of us cannot. I mean, who starts off having visited Heaven before you turn four, y'know?! (Laughs) When he was still little, he used to ask me, "Dad, why don't adults believe in the Bible, what's their problem?" How do you answer that? My best answer to him was, "Well, no one's seen what you've seen." It took him a while before he realized he was different from everybody else; he thought everyone else knew what he knew. AH: Has Colton met Akiane? TB: He has, about a year-and-a-half ago. We met her on the Katie Couric Show, which we were also on. We got to go out to lunch—that was the first time he got to meet her and spend time with her. It was a great experience. She is a very unique person, and is also featured in the film. AH: Todd, would you say that looking back, Colton's experience in Heaven has also deepened your own faith? TB: It's definitely given me some peace. Peace is a powerful thing. When you know that you're right, and you have more evidence and confidence in that, it changes your boldness... it changes the fact that you don't have to argue with people. You can still talk to them. His answer was perfect. He said, "Well, he can believe what he wants to, but I know what I saw, that doesn't change anything." He doesn't feel like he has to fight, but he doesn't compromise either. That same uncompromising child is depicted in the movie. I just wonder how much more effective the Church would be if we would be like Colton when dealing with the doubters. AH: Good point! Todd, what is your hope when it comes to the book and now the movie, "Heaven is For Real"—what do you hope those who read and see it will take away from it? TB: I think my hope has always been that people would realize that what Jesus did for Colton, He wants to do for them too. If we will just be open to let Jesus do that in our lives. The love and the peace and the healing that He wants to bring to peoples' lives is real. Heaven's real because Jesus is. When people see this movie, that is—more than anything else—what I hope they take home from it. That they would open up their minds to say, "I want that, I need that." Find where "Heaven Is For Real" is playing in a theater near you by Clicking Here; it opens on April 16th.